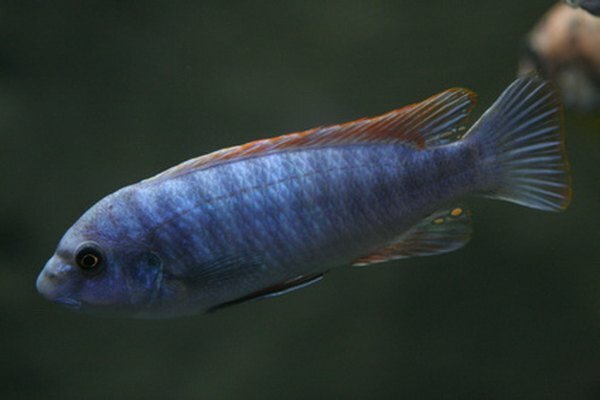 Cichlids from the Rift Valley, particularly Lake Malawi are most vulnerable to this disease. Cichlid bloat (sometimes called Malawi bloat) can strike any fish, but happens most often in Rift Valley Cichlids. The cause is a mystery, but if you see abdominal swelling, thing white feces and bloody ulcers on the skin, there are steps you can take to treat and hopefully cure it. Quarantine the fish if possible. One of the leading hunches is that a parasite causes it. If you only have a single sick fish, move it to a quarantine tank for treatment. If several fish show symptoms, perform your treatment in the main tank. Perform a water change. Whatever the cause of cichlid bloat, improved water conditions will help your fish. Change 30 percent of the water with a bucket and aquarium siphon. Remove carbon and zeolite filter media. Many aquarium filters contain inserts that absorb harmful chemicals. Unfortunately, they also absorb medications. Remove any filter inserts or cartridges that contain activated carbon or zeolite. Replace them in case they contain a parasite. Add Epsom salt to the water. It will raise the pH, simulating the water conditions your African cichilds are used to. Around 1 milliliter of it per 10 liters is the right amount. Medicate the tank. Anecdotal evidence suggests that Metronidazole and Clout can effectively treat cichlid bloat. Treat cichlid bloat like it's contagious. No one knows for sure what causes it, but better safe than sorry. Improve water quality. If a parasite doesn't cause cichlid bloat, it could be poor water quality. Add hiding places for your cichlids. Stress may be a factor. Follow all instructions and warning on aquarium medications. Some can be toxic if used wrong. Use care when performing water changes; water is very heavy. What Happens When a Cichlid & a Betta Are Placed in the Same Fish Tank? What Is a Hap Cichlid?